The second edition of Pakistan Super League (2 PSL) Twenty20 is all set to begin in February, 2017 in United Arab Emirates. 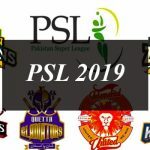 The 2PSL T20 2017 is the second edition of Pakistan Super League with same number of cricket teams. The 2nd edition of Pakistan Super League 2017 will be a big event as Pakistan Cricket Board (PCB) will include more teams and foreign cricket players. The 2nd edition of PSL 2017 will be a tournament which will stay for four weeks this year. PSL has declared the inclusion of England internationals Jimmy Anderson, Stuart Broad, Eoin Morgan, Moeen Ali, Jason Roy and Steve Finn for 2017 PSL T20 tournament in UAE. Former Australian Test skipper Michael Clarke has officially confirmed that he is not going to be the part of Pakistan Super League 2017. The draft for the 2017 PSL edition is schedule to be held on 18th and 19th October, 2016. For full live streaming of Pakistan Super League, PSL T20 2017 live scores, Live updates, Schedule stay in touch with Daytimes.pk.